1. Equipped with 8mm Tempered glass plate, resistant to friction; once the glass is broken,the glass shards are no sharp to ensure the safety of operator. 2. The timer can set the exposing time, after reach the exposing time, the machine automatically turns off the tubes. 3. The timer have automatic memory funtion, set in once, whether the number of swith turn on or off, time will save. 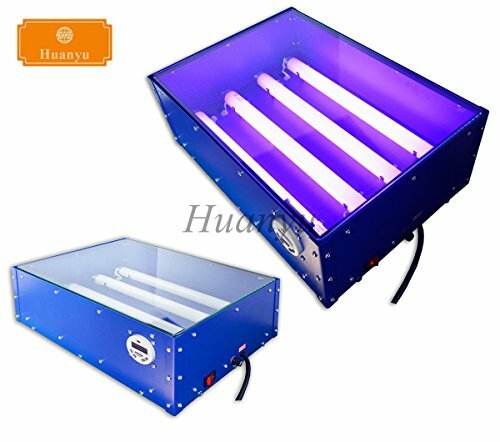 There are four 15w light tubes (power of light tubes 60w; spare prat: one tube and a Ballast), it can normally be used for about 10,000 hours. Equipped with shading cloth, cover the top of whole machine, block the UV damage to the operator. This machine equipped with 20*30*6cm songe, used for press the film more closely, place a flat weight, improve the quality of exposing.